Cat owners are being warned not to ignore their pet’s health needs just because their feline friend hates car trips to the vet. During Animal Pain Awareness Month in September, Pawssum WA state manager Louisa Fenny said many owners failed to ensure their cats had an annual health check simply because they struggled to get them into the clinic. “The simple fact that cats are hard to get into a cat carrier – many of them have a phobia about them – to transport them to the clinic means they can be at extra risk of health issues which can be painful for the pet and costly for the owner – both emotionally and financially,” said Dr Fenny. 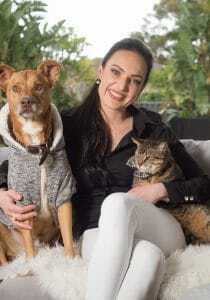 The veterinarian said she hoped the worrying trend could be reversed with the expansion of mobile vet services, like Australian app-based mobile vet booking service Pawssum, which she’d recently signed up to treat pets through. Pawssum vets can help with urgent medical check-ups, vaccinations, dental, heart, eye and ear checks, taking blood and lump samples, in-clinic follow up, dog training and telephone or video chat check ups. The Pawssum app also keeps your pet’s complete health records handy at any time, meaning any vet can access them without the hassle of contacting another clinic or vet.